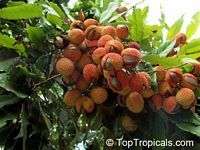 3757 Litchi chinensis - Hak Ip lychee, 3 gal pot, Air-layered ? Meaning “Black Leaf” in Chinese, it refers to very dark green leaves. The fruit is large, sweet, with a small seed. Preferred variety for the home garden. Very close to Sweetheart variety. 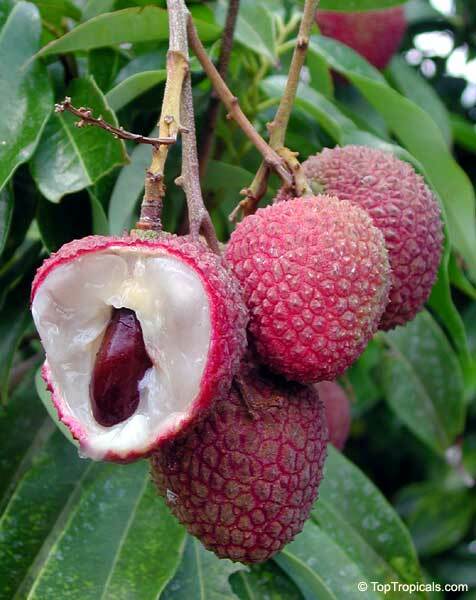 You've eaten Lychee no doubt in Chinese restaurants. Under the brittle crimson skin, the flesh is pearly white, sweet and jelly-like, though firm. It is eaten fresh or sun-dried (Litchi Nuts) or canned in syrup. It is a good source of vitamin C and phosphorous. 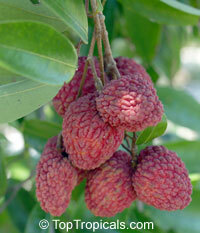 1146 Litchi chinensis - Lychee Brewster, Air-layered ? Vigorous upright tree of hemispherical shape, a heavy producer planted commercially. The fruit is medium sized, deep red, with excellent taste. 4635 Litchi chinensis - Lychee Mauritus, Air-layered ? A vigorous tree with a lateral habit. Grown commercially, it is an early, regular and heavy producer of smaller fruit with pinkish-green skin that are slightly tart and spicy. 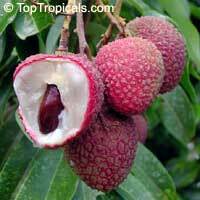 2408 Litchi chinensis - Sweetheart lychee, Air-layered ? The finest of all varieties, premier choice by dooryard growers for its reliability and superior quality. 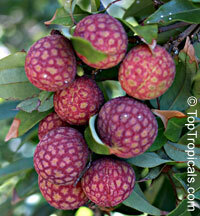 It has huge, heart shaped, juicy fruit with very small seed.